A well set-up helm station offers excellent vision through the wise glass screens. Communications are placed out of the way in the roof bulkhead. 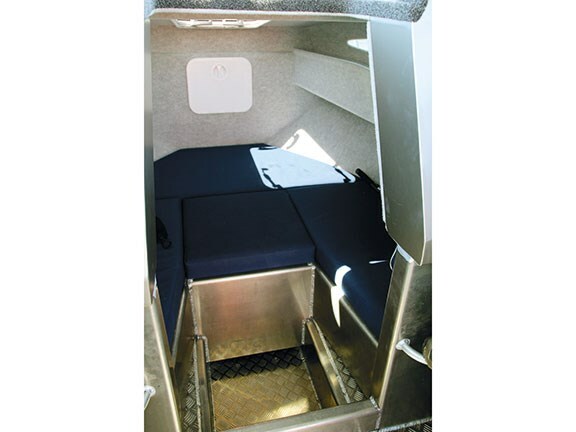 The enclosed cabin has full-length bunks and a plumbed toilet hidden benath an infill. Aft guard rails create extra fishing space either side of the outboard, so long as you don’t mind wet feet. Crossing a west-coast harbour bar should never be undertaken lightly. 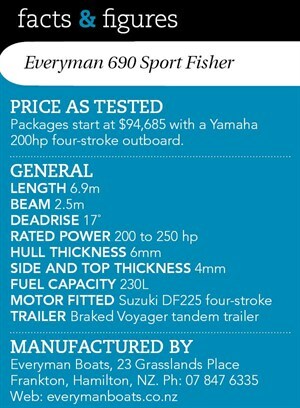 Norman Holtzhausen discovers the Everyman 690 Sport Fisher is up to the task. 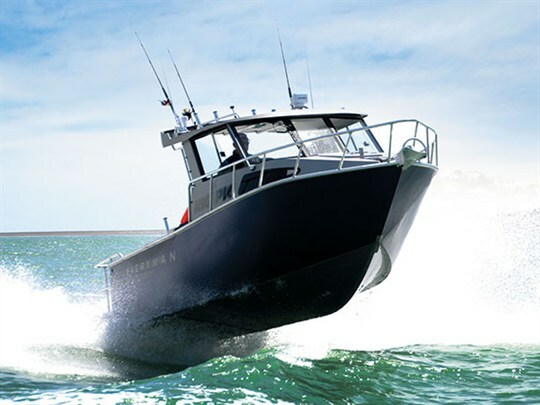 When Russell Spiers of Everyman Boats called me up for a trip to the 'wild west' to show off his latest 690 Sports Fisher, there seemed little point in arguing about workload and deadlines. Big snapper were being pulled in off Kawhia, so rearranging my schedule seemed worthwhile. After a scenic early morning drive through the Waikato we rendezvoused at the Kawhia boat ramp. Soon we were blasting toward our chosen fishing spot at a comfortable 25 knots. The big rolling swells meant we were not able to open up the Suzuki, but we had power to spare. Acceleration was awesome, with the motor having no trouble with a full load of four adults, gear and a full tank of fuel. This latest roomy and capable 690SF reflects a trend toward buyers seeking larger models as the economy here in New Zealand continues to recover. 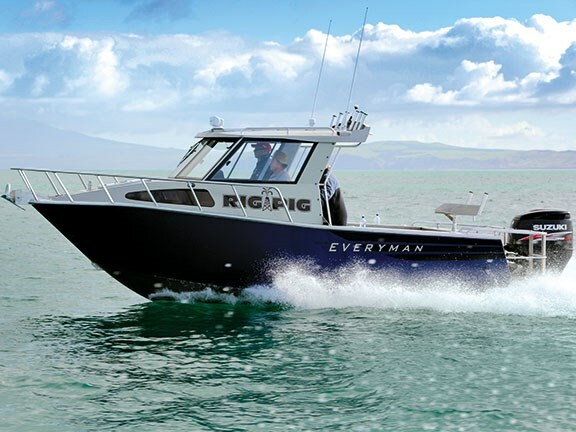 Everyman Boats now counts 14 models in its range with this latest inclusion which features a fresh hull design, aimed squarely at those wanting rugged offshore capability in an affordable and easily-towed package. Boasting a hull length of 6.9m and a beam of 2.5m, this latest model provides plenty of fishing real estate, as mentioned above. The hull has a 6mm bottom – well able to withstand any rough handling – while 4mm sides ensure it's not too top heavy. Add in sealed underfloor buoyancy chambers, and even if the worst happens, you'll always remain (more or less) afloat. The chief difference between this model and the similarly-sized 685 is the raised sheerline in the bow. This higher foredeck provides increased volume and hence, greater buoyancy for powering through big water such as that found on a bar crossing. The fine entry on the other hand, assists in cutting through waves without undue lift, making a safer ride without loss of control. Unchanged is the substantial bow rail and sturdy bowsprit to hold the anchor, while a Quick automatic windlass is tucked into a foredeck recess. Back inside the enclosed cabin, the carpet-lined forward berth has full-length bunks with generously thick squabs. An infill lifts to reveals a plumbed toilet with electric macerator in the bow. There is plenty of headroom in the cabin, and a further infill section could turn the bunk into a triple berth. The helm position is unusually comfortable, featuring a well-padded bench seat that is extremely wide. What's lost in the seat not being laterally adjustable is gained in being able to shift position along the seat to suit individual preferences. Both skipper and passenger seats are of a similar design, each backed by a well-padded queen seat facing the rear. All Everyman Boats can be customised to suit the purchaser, and conventional soft-rider pedestal seats are available as well as other seat configurations. 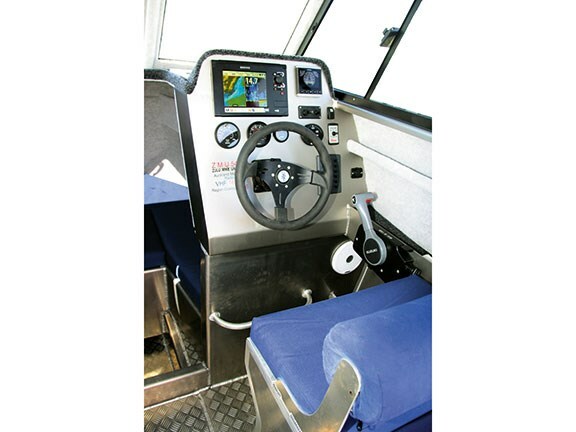 The huge flat dash area can accommodate an impressive array of electronics, and our review boat had a Simrad NSS8 touchscreen chartplotter and fishfinder installed in prime position. Conventional analog speed and engine RPM gauges were also installed. Controls for the Quick windlass and the Lenco trim tabs, as well as the usual switch panel, completed the instrumentation. 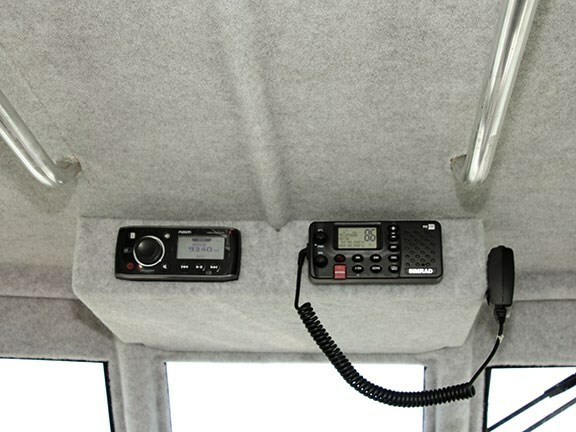 A VHF radio and Fusion sound system are mounted in the ceiling of the hardtop, keeping them neat and readily accessible. Steering is hydraulic and the throttle is well positioned away from the steering wheel. Since the seats are not adjustable, footrests and grab-handles are provided for both skipper and passenger. A windscreen wiper is fitted to the skipper's side, and for bar crossing this is more a requirement than a luxury. Visibility is critical when facing oncoming swells, where a wave splashing onto the windscreen and causing temporary loss of vision could have serious consequences. The cockpit space is classic Everyman, with a large uncluttered area. The gunwales are wide enough to sit on comfortably, and the rear bench seat doubles as the battery compartment cover, neatly folding up to hide the dual batteries when not required as a seat. Everyman take the time to build proper drink holders into their boats — not those flimsy plastic affairs that always break — and a couple of sturdy can holders are recessed into the gunwales along with several rod holders. The hardtop features a rocket launcher with six more rod holders, and a bright LED spotlight to illuminate the cockpit during evening sessions. A sturdy grab rail along the rear of the hardtop complements rails running along either side, as well as down the middle. This boat has plenty to hold onto! 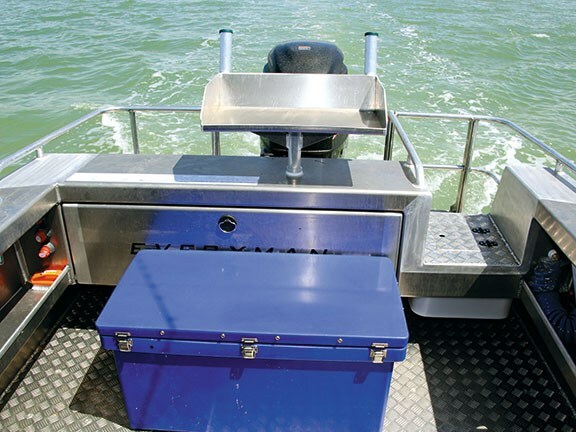 The wide boarding platforms either side of the big Suzuki outboard both have an enclosed guard rail, forming a 'cage' that is the perfect spot for fishing if you don't mind the possibility of wet feet. The port side has a hinged section that swings down to form a wide boarding ladder, with a cleverly designed clip to hold it shut. Which brings me back to the fishing …we were here for a "serious" session, the boat test being merely an excuse, so we set about promptly locating our target species. Local intelligence had told us that the 50m contour was the place to be, so we headed out to join the dozen or so boats already there. The bottom was mostly flat and featureless, we soon spotted some structure that seemed to be holding fish and a mixture of baits and jigs headed down. The boat proved itself to be fantastic for fishing, with the big cockpit easily accommodating four or more anglers actively working a rod each. Two more anglers are each able to fish from the boarding platform, thanks to the sturdy safety rails. Wet feet for those out the back and a trace of sunburn were the only issues we faced, with the boat proving eminently stable and comfortable. It soon became apparent the fishing gods were in a good mood. Although double-digit sized snapper were elusive, we managed to get some excellent fish in the two to three kilo size along with a rig, several kahawai, some super-sized gurnard and a feisty kingfish. By early afternoon the fish bin was full of the good stuff and we were close to our limit. Heading back over the bar, it had flattened considerably, with only a few gentle rolling waves still present. We used these to put the boat through its paces, pushing the throttles hard to get it airborne over the biggest waves. The chines kept the spray down off the windscreen and the boat tracked straight and true. There was very little tendency for the bows to lift, so we remained in complete control at all times. Overall this is a great boat. It's width and significant length on the trailer make it a formidable towing proposition, but well within the capabilities of most good 4WDs. The boat is spacious, stable and fuel efficient, with the trip using only a fraction of the 230L underfloor tank's capacity. 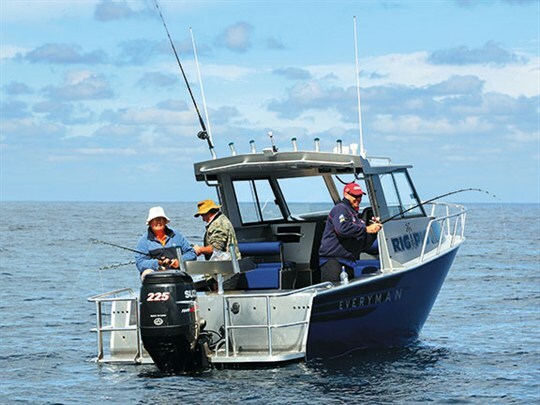 Everyman Boats prides itself on building seriously solid boats with good handling, and fitting high quality gear. All of this at an honest price that won't break the bank, and this new model ticks all those boxes yet again.